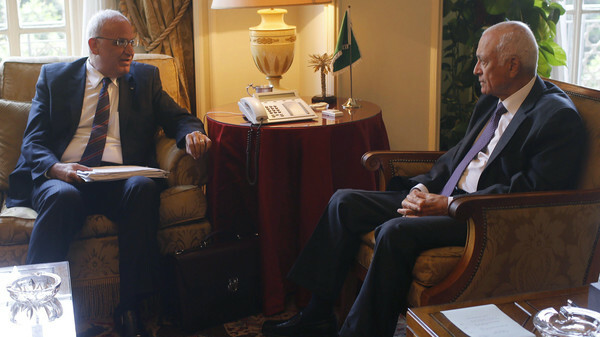 Palestinian chief negotiator Saeb Erekat (L) talks with Arab League Chief Nabil el-Araby during their meeting at the Arab League in Cairo August 11, 2014. Israel and the Palestinians began talks in Cairo on Monday to try and end the conflict in Gaza and lift the blockade on the coastal enclave, Egypt’s state news agency MENA said. The indirect talks are being mediated by Egypt and began a day after the two sides agreed to begin a new 72-hour truce. Israeli troops killed a Palestinian in the occupied West Bank on Monday during a raid on his house near the city of Nablus, local medical officials said, according to Reuters news agency. An Israeli military spokeswoman said she was aware of troop activity in the area but initially had no further details. Zakaria al-Aqra, 23, was wanted by Israel and had been shot dead, local witnesses said. Six other people were wounded. Part of Aqra’s house was destroyed by an army bulldozer, they said. Aqra is the third Palestinian to be killed in Israeli-Palestinian clashes in the West Bank in four days. Meanwhile, four Palestinians who were seriously wounded during Israel’s assault on the Gaza Strip arrived in Turkey for treatment in Ankara hospitals, with more expected to come, state media and officials said Monday. Three women and a teenage boy were flown out of Tel Aviv on a Turkish air ambulance and were received at Ankara airport by Turkish Foreign Minister Ahmet Davutoglu early Monday, the Anatolia news agency said. “In the first stage, we plan to bring to Turkey around 200 patients for treatment,” Davutoglu was quoted as saying by the Anatolia. “We are doing whatever we can to take in as many patients as possible,” he later wrote on Twitter, where he shared pictures of himself and his wife talking to the wounded Palestinians. Meanwhile, Israel and the Palestinians began talks in Cairo to try and end the conflict in Gaza and lift the blockade on the coastal enclave, Egypt’s state news agency MENA said. On Sunday, U.N. Secretary-General Ban Ki-moon welcomed the news of a fresh 72-hour ceasefire between Israel and Hamas, urging the two sides to work towards a longer-term truce, Agence France-Presse reported. The latest ceasefire began at 12:01 am on Monday (2101 GMT Sunday), after days of frantic mediation in Cairo to halt the violence that has killed 1,939 Palestinians and 67 people on the Israeli side since July 8. Ban “expresses his strong hope that this will give the two sides, under Egyptian auspices, another chance to agree on a durable ceasefire for the benefit of all civilian populations and as a starting point to address the underlying grievances on both sides,” a statement from his spokesman said. “The United Nations stands ready to assist in the implementation of an agreement that would consolidate peace and allow for much needed reconstruction and development of Gaza,” the statement added. Egypt, which has acted as a mediator in the conflict, has urged Israel and the Palestinians to use the new truce to “reach a comprehensive and permanent ceasefire,” after an earlier three-day truce ended Friday. Between the two ceasefires, warplanes hit more than 170 targets, killing at least 19 people, while the Palestinians fired at least 136 rockets at Israel, of which 93 hit and 13 were shot down, with the rest falling short inside Gaza, the army said.